ICON Profile Pictures > What I'm doing this summer. What I'm doing this summer. 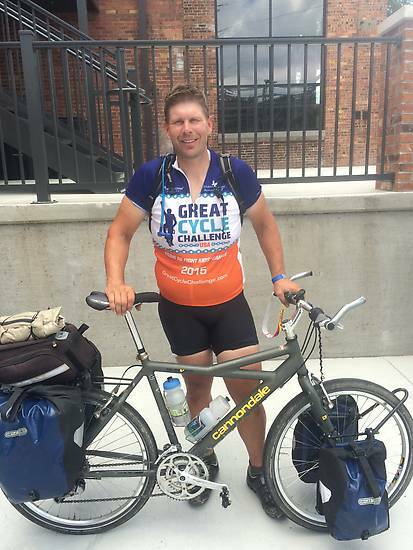 Fellow insulator collector, Brian Riecker, is riding his bicycle across the country this summer as a fundraiser for the Children's Cancer Research Fund. Brian's goal is to ride 5,000 miles and raise $50,000 in three and a half months for the cause. He started his journey in Port Arthur, TX on April 26 and has meandered through Texas, Louisiana, Arkansas, Oklahoma, Kansas, Missouri and Illinois. So far, he has raised over $2,000. Please show your support for Brian by giving to a great cause. Please visit https://greatcyclechallenge.com/Donate/Rider/8784.